Martin Pinnavaia: ... I got a job working at the Carey Arboretum for about a year as a greenhouse assistant, and I really started to like it. After about a year of working there, I saw an ad in the Poughkeepsie Journal for gardener at Vassar College, and I applied for the job and got it. Our conversation then turned to a discussion of Marty’s duties and the different gardens on campus. 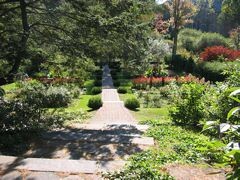 The gardens under his jurisdiction include all display/annual beds, Noyes circle, Main Circle, Shakespeare Garden, and outside and indoor planters. We discussed these gardens and their history, as well as the changes and improvements Marty has made in his twenty years as head gardener. Jennifer Dawson: ... Can you tell me a little bit about Main Circle? MP: When people drive in it’s the first thing they see... we always try to keep it very interesting; I plant it in a European design by having plants at different heights and different levels so that you have a tiered effect, and also the garden is viewed from the front and the back, so we have to make the back of the circle just as interesting as the front. I try to change the color schemes every year... as new plants come out on the market, we try them out out there - it’s full sun, and it’s one of the best spots to grow annuals, so most things really always do well out there. We always try to keep that looking well-manicured. Noyes circle was the first garden at Vassar - originally known as “The Circle,” the cedar trees surrounding it were planted by Matthew Vassar himself in order to give his students privacy while they exercised on the path running along the inside of the garden. Vassar was a firm believer in the activity of women’s bodies as well as their minds, and the circle was created so that they might exercise in a beautiful setting. Noyes circle has served many other purposes as well, from the site of the first college women’s field day to an educational garden for the botany department, to its current use as the front yard for Noyes House and an intramural sports field. JD: What about Noyes Garden? MP: Noyes garden used to go around the entire circle and it was a running path for the women... it was an athletic circle. As the dormitories were built, Noyes dormitory took up a giant section of the circle, and then also on the far side of the garden the cedar trees grew taller and taller, blocking out the sun, so the only really sunny spot left in the garden is where the garden is now. We then turned to the crown jewel of the Vassar grounds: the Shakespeare Garden. MP: [When I came here in 1984,] in the Shakespeare garden all the beds were confined by railroad ties, wooden rotting railroad ties, and we substituted the railroad ties for bricks... we commemorated the beds... we put a plaque on it, saying this bed is dedicated to so-and-so... we managed to totally restore the Shakespeare Garden. JD: The original purpose of the Shakespeare garden was to collect all the plants that were mentioned in Shakespeare. Do you still do that now? MP: Yes... the true meaning of a Shakespeare garden is to house plants that were mentioned by Shakespeare in his plays and sonnets - but, since we’re not in England and we can’t maintain a lot of the plants mentioned that were used in English gardens, what we do is we combine plants that were mentioned by Shakespeare with plants that were grown in English gardens during Shakespeare’s time, to also give more of a display purpose to the garden, a lot more flowers... we kind of blend the two worlds together and everyone’s happy, and it keeps the garden looking nice, and it still has a lot of meaning to it. JD: Where do you get your inspiration or your influences for your designs? MP: I visit a lot of other gardens, I have friends down at the NY Botanical Gardens, I have friends in Cobleskill, and Carey Arboretum still - I visit a lot of gardens and gardeners love to give other gardeners cuttings and plants and swap things - Locust Grove, the Samuel B. Morse estate, we just did a major plant swap with them, we did a major plant swap with Mohonk Mountain House... you talk to other people and you get lots of magazines, lots of plant magazines, horticulture magazines, and garden design magazines - you get ideas from other magazines and gardens... A lot of it’s basically networking and having a lot of gardener friends. The entrance to shakespeare garden. Marty was also instrumental in the growth of Vassar’s other famous plant collection - the orchid collection. 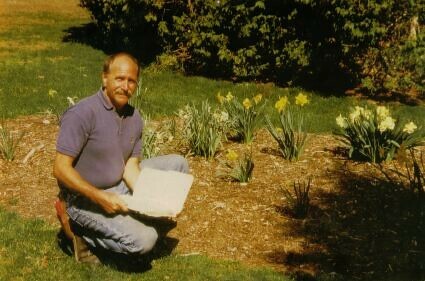 He has a large greenhouse of orchids of his own, and first began to garden because of his love of orchids. He explained how he expanded the collection to its current size. JD: I know we also have a large orchid collection. Could you tell me a little bit about that? MP: When I came here in ‘84 there were maybe 15 orchid plants here, and I love orchids; I’m an orchid enthusiast myself and I have a lot of friends that grow orchids, and orchids grow and grow and they reproduce - you have to divide them continuously... so most of the people who I know who are orchid enthusiasts look for places to donate the orchids to, so they can make room for their other orchids. I managed to build up a great orchid collection just by having people donate orchids to us... [which] we use a lot for display purposes. Today the plants for the grounds department are housed in the Skinner greenhouses, and the biology collections are housed in the Olmsted greenhouses, but neither of those are the original Vassar greenhouse. The first greenhouse on campus, the “Eleanor Conservatory,” was donated in 1886 by William R. Farrington of Poughkeepsie, in memory of his late wife, Eleanor Farrington. That greenhouse stood between where the Kautz Admission House and Ferry House are located today, and in later years was used as a sculpture studio in addition to a greenhouse. The other greenhouse was the New England greenhouse, which was located on the back of New England building and used to house the biology collection until Olmsted was built, at which point it became the tropical greenhouse. MP: The [Skinner] greenhouses were built in the 50’s... they were originally used to grow cut flowers for the school, and when I came here a few years after, I just thought it was a terrible waste of space to grow cut flowers when you can buy them cheaper than growing them, and we started doing away with the cut flowers... [now we use the space] to grow herbs for the dining hall, annuals for the flower bed that everyone can see, housing plants for the planters outside of the buildings that everyone can see for the spring, summer, fall - it just made more sense to be growing things that were more useful for the college. The Olmsted greenhouse is used basically to house collections, collections of plants that are genus/species labeled; it’s more of an educational greenhouse, and also for experiments. So that’s strictly biology use. JD: What about the other greenhouses on campus? The ones that no longer exist? MP: The New England greenhouse was, I believe, the original biology greenhouse for the college... New England used to be covered with ivy, when Fran Fergusson came here she realized that the ivy was eating into the mortar between the bricks... so they stripped the buildings of the ivy, which was rooting in, and sandblasted the brick and got the buildings back to beautiful condition, and then that greenhouse started looking a little shabby... we just decided to take the greenhouse down and consolidate, now that the cut flowers were no longer being grown up at the Skinner greenhouses, we were able to take the tropical plant collection, which is what the New England greenhouse had, and consolidate it under one roof. The other greenhouse was next to the admissions building, and was actually known as the sculpture greenhouse - they used to use that for sculpture because it had natural daylight... [then]Doubleday studios were being built at the time, so the greenhouse lost its reason for being, and they took it down. The greenhouse that was next to the admissions building, the one that I knew, was really just half of what used to be there - that was the propagating range, where they used to grow the plants, and the front of the greenhouse which no longer existed when I was here... was called the “Vassar College Conservatory,” and it was an English conservatory domed building, kind of like a palm house... they would grow the plants in the back and bring them out for display... most botanical gardens have that kind of setup.